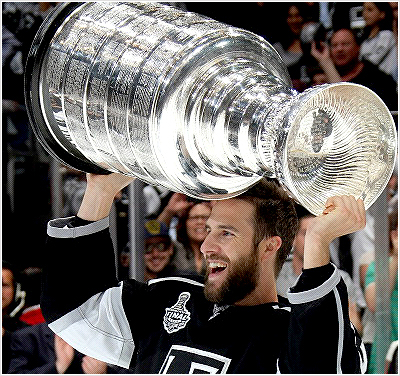 Simon Gagne and the Los Angeles Kings are the 2012 Stanley Cup Champions! This is it! Moment, which many Gagne fans were hoping to see. Simon Gagne lifted the Stanley Cup above his head last night (though with a little bit of difficulties). I don’t think that writing a regular game recap is necessary at this point. What is important is knowing that the Kings did it. They managed to convert their third match-point into a victory and are now celebrating their first Cup championship in the history of the franchise. They beat the New Jersey Devils 6-1 and 4-2 in the series. 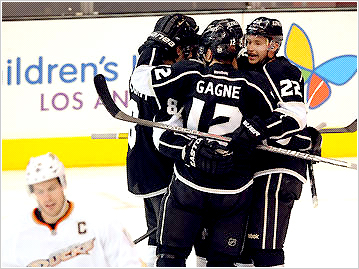 I’d like to take this opportunity to congratulate the LA Kings but most importantly Simon Gagne. There is no denying I had tears in my eyes as I watched him with the Cup above his head, grinning from ear to ear like never before. Looking back to the first half of the season, to Simon’s injury and numerous rumors and speculations about the end of his playing career, that all made last night that more special and rewarding. Simon did miss a big portion of the season and some might argue he didn’t really had much hand in the Kings’ success but I beg to differ. Despite missing a chunk of games he was and still is a part of the team as anyone else. He stayed around, he kept fighting through probably the most frustrating injury a hockey player can sustain, and he never gave up on the possibility of playing at least one more game in the 2011-2012 season. In the end, he played four and even though he didn’t record any points, he earned himself a place in the hockey history. And rightfully so. Gagne has been in the league for 12 seasons and it wasn’t until now that he finally reached the peak and claimed the ultimate price. They say that “you don’t deserve the Cup, you earn it” but I have to believe than nobody will disagree with me when I say that Simon did deserve it, no matter how much (or how little) impact he might have had on this particular Stanley Cup win. The party had to be put on hold. The fourth win is the toughest one, they say, and it was proved again last night. The Kings didn’t start the Game 4 of the Stanley Cup final too bad. Even though they didn’t capitalize on their first power play which came at 3:02 of the first period, they managed to kill both Devils man advantages. They seemed to be going in the right direction as they generated some good chances towards the end of the period, playing on a power play again. In the last few minutes of the first frame they hit a post twice. Ever since then though it felt like it wasn’t the same team that beat the Devils 4-0 on Monday night. The game was scoreless after two periods. It was the Devils who broke the scoreless tie when Patrick Elias put the puck behind Quick at 7:56 of the third period. Even though the Kings tied it on a power play exactly one minute later with a goal from Drew Doughty, the Devils managed to grab the lead again. Adam Henrique made it 2-1 with only 4:31 left in the third period. The Kings weren’t able to manage anything more offensively, also due to outstanding Brodeur in the Devils net and at 19:40 Ilya Kovalchuk added an empty netter to make it 3-1. The Devils won, thus forcing a Game 5 which will be played on Saturday at 8 p.m. ECT. Simon had a really good game. Even though he played only for 7:49 minutes (on the fourth line with Lewis & Fraser), he managed to create some great chances. He had a semi-breakaway towards the end of the second period but Martin Brodeur came up big and kicked the puck away. In the third period, Gagne had a 2-on-1 chance with Trevor Lewis, passing him the puck beautifully, Lewis couldn’t capitalize though. Simon had 2 shots on goal and 3 missed shots and also recorded 1:02 of power play time. Despite having a really good game he finished it with minus-1 rating, that only because he was on the ice for the Kovalchuk’s empty netter. SCF Game 3: Simon is back! 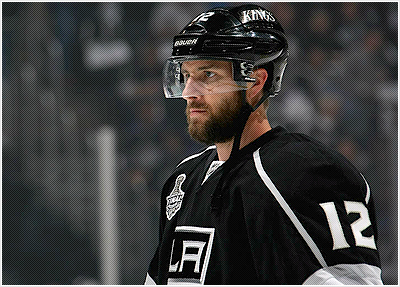 As I informed you on Twitter yesterday, the Kings inserted Simon Gagne back into the line-up, in place of Brad Richardson. Needless to say it was probably the best news in months. The Kings returned to their home arena with a 2-0 lead over the New Jersey Devils, seeking another win to grab a commanding 3-0 lead. After the scoreless first period, which saw the Devils fail to cash in on multiple power plays (a lengthy 5 on 3 inlcuded) the Kings opened the score at 5:40 of the second period with a goal from Alec Martinez. At 15:07 of the middle frame LA extended their lead to 2-0 when Williams-Brown-Kopitar line made a beatufiul tic-tac-toe play, getting the puck behind Brodeur from a stick of Kopitar. At 3:29 of the third period the Kings got their first power play opportunity in the series when Mark Fayne went to the penalty box for cross-checking. Unlike the Devils who had total of 5 PP chances, the Kings cashed in. Jeff Carter made it 3-0 at 4:15. Not even 3 minutes later Justin Williams scored another power play goal to make it 4-0. And that was it. With a tremendous goaltending from Jonathan Quick and great team’s penalty kill the LA Kings won and took the 3-0 lead in the series. They will be looking to ending the series on Wednesday, playing for the first Cup in franchise history. It was Simon‘s first game since suffering an injury on December 26 2011 and he played really solid. He played most of his time on the fourth line and his 6:39 minutes of ice time came all at even strength. As the game went on it was visible he was getting more and more comfortable. He was credited with 3 shots on net (top of the Kings along with Williams and Carter) and one hit. The Kings returned to their home arena to host their division rival the Anaheim Ducks. It was their first home game since December 10 but most importantly their first game under the new headcoach – Darryl Sutter. Prior the puck drop it was known that the Kings players are ready and excited for a fresh start. And it somewhat showed in their game. They had a good puck possession, better o-zone entrances and more of the shots could be labeled as “quality” (rather than just shots from the point, without a screen or a chance on deflection). They killed off two Ducks power plays in the first period and despite not scoring themselves (primarily thanks to great perfomance from Jonas Hiller) they were on to a good start. Though, it was the Ducks who opened the scoring. At 13:55 Niklas Hagman made it 1-0 Ducks. Fortunately, not even 3 minutes later the Kings tied the score. Mike Richards (who returned from a head injury after missing 8 games) won the face off to Hiller’s right. Richards got the puck to Doughty who fired it at the net, then it was Richards again who deflected it, not giving Hiller a chance. Tied game. In the second period the Kings were given their share of power play opportunities, they didn’t capitalize on any though. In the middle of the third period Anze Kopitar found Dustin Brown with a nice drop pass. Kings captain then made it 2-1 with 11:58 left in the third. The Kings did try to get that forbidden 3rd goal but it was the Ducks who scored instead. With only 3:11 left, Lubomir Visnovsky tied the game at two. The game headed to overtime. At 1:55 Drew Doughty stopped Bobby Ryan on a break away but earned himself a holding penalty. The Kings managed to kill the usually deadly 4 on 3 Ducks power play. With 30 seconds left in OT they were even given their own when Bobby Ryan went to the box for holding. The Kings didn’t convert so the game had to be once again decided in the shootout. While it was only Perry who scored for the Ducks, Stoll and Brown scored for the Kings, thus earning the W for their team. Simon had a rather average game. He didn’t stand out neither in a good way nor in the bad way. He was even in the +/- rating, had one shot on net and one missed shot. The Kings play in San Jose tonight so here’s hoping he’ll finally hit the net. 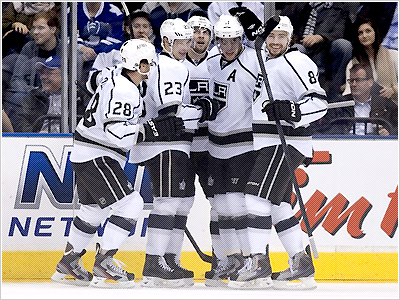 Kings finished their 4 game road trip with a 3-2 shootout win against the Toronto Maple Leafs. If there is something the Kings are consistent at it’s being inconsistent. In their previous game in Detroit they looked like a Pee Wee team, last night was a different story. For the first time in forever they took a lead in the first period – at 7:54 Justin Williams made it 1-0 when Drew Doughty dumped the puck in and it bounced off the boards awkwardly, right on the stick of Williams who was left alone in front of Reimer. 3 minutes later, at 11:01 the Leafs tied the game though with a goal from John-Michael Lile. First period was full of penalties but neither of the teams managed to capitalize on any. But towards the end of the second period, when Luke Schenn was in the box for tripping, the Kings used their advantage. Drew Doughty kept the puck on the blue line (not really but the linesman missed it), passed it to Anze Kopitar who then sent it to Simon Gagne who was on the goal line to Reimer’s left. Gagne then found Brown in the slot who didn’t miss and put Kings up 2-1. Unfortunately though, not even 3 minutes into the third period the Leafs tied it once more when Gagne didn’t cover Matt Frattin who tipped the puck behind Quick. The score didn’t change, not even in the OT and despite numerous chances on both sides the game had to be decided in the shootout. After no goals from Kessel, Stoll, Frattin, Kopitar and Lupul, Dustin Brown had a chance to win it for the Kings. And he did. He beat James Reimer and the Kings grabbed the much needed extra point. After barely beating the dead last Columbus Blue Jackets on Thursday it shouldn’t be that surprising that the LA Kings lost to the Detroit Red Wings last night. And they lost bad. Exactly two minutes into the first period it was 2-0 Wings after Miller and Emmerton scored 15 seconds apart. At 8:32 it was 3-0 thanks to Kronwall. And Jonathan Quick headed prematurely to the locker room (after allowing three goals on 7 shots) while Jonathan Bernier took his place in the Kings net. At 17:15 of the first period the Kings showed some life with a goal from Drewiske but any hopes for a comeback were killed when only 80 seconds later Detroit made it 4-1, Emmerton scoring his 2nd goal of the night. In the middle of the 2nd period the Kings again came within two goals when Jarret Stoll got the puck behind Howard but again, barely a minute later Henrik Zetterberg improved his team’s lead to three goals. And ever since then, the gap only grew bigger. At 19:38 of the middle frame Datsyuk made it 6-2 and in the third period the Wings added two more goals – at 7:34 Drew Miller and at 11:18 Brad Stuart on a power play (Colin Fraser was in the box). Thus the game ended with a horrid score of 8-2. 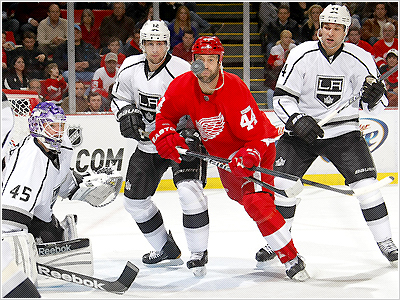 No matter the Kings outshot the Wings 29-27. No matter the Kings outhit them 29-16. No matter the Kings won 51% of the face-offs. 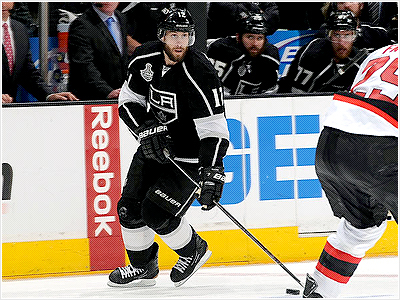 The Kings had about gazillion of turnovers, mental lapses and only two goals. And they lost. Simon was as good as the rest of the team. Which means not very good. He did have some moments, collecting 2 shots on goal, 1 attempt blocked and 1 missed shot. Positive is also 1 hit and 2 take aways. He also managed to stay even in the +/- until the middle of the game but unfortunately ended up with a minus-3 record. Well, given the fact he had 18:43 of ice time and with Detroit being on a scoring spree, it’s not so shocking stat. Plus, only 4 players on the team were able to stay off the negative rating – Williams(+2), Penner (+2), Stoll (+2) and Drewiske (even).